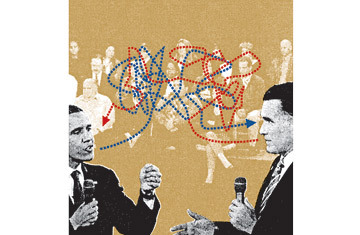 The second Presidential debate between Mitt Romney and Barack Obama provided a very precise summary of the 2012 campaign so far. It demonstrated the candidates' strengths and revealed their weaknesses. And it illuminated the frustration that many informed voters have had with this race: Romney's proposals for the next four years are ridiculous; the President's are nonexistent. I've always believed that the town-meeting debate is the most important event of the fall campaign. It has produced the most memorable moments: Bill Clinton's empathy, Bush the Elder's glance at his watch, Al Gore's stalking of Bush the Younger. It's where the public gets to see the candidates actually dealing with their fellow citizens. It is, I believe, the moment when a great many people viscerally decide which candidate they want to invite into their homes for the next four years. But I must say: this year's edition was the most tepid I can remember, in terms of interaction between the candidates and the live audience. In 1992, Clinton hit his empathy mark not by taking the famous steps toward a woman who had asked an anguished question about the economy, but by asking her a question: How had the economy affected her? There were no such moments in 2012. Quite the opposite, in fact. At one point, the President pretty much ignored a question about gasoline prices. Indeed, the candidates seemed more concerned with each other than with the audience--and that too seems a metaphor for the 2012 campaign: our political system is increasingly self-absorbed, myopic and remote from the realities of daily life. Overall, the President was the stronger candidate in the debate, as he has been for most of the year. He was a more forceful presence. It was, I think, his best debate performance since his first confrontation with John McCain in 2008, when he turned McCain's perceived strength--foreign policy--into trigger-happy weakness. And once again, foreign policy provided him with his strongest moment: his splendid takedown of Romney's foolish attempt to turn the terrorist attack on the U.S. consulate in Libya into a political issue. "The suggestion," Obama said, "that ... anybody on my team would play politics or mislead when we've lost four of our own, Governor, is offensive." And then Romney's intermittent relationship with factual accuracy--another enduring feature of this year's campaign--allowed the President to take it a step further. Romney accused Obama of making a false statement when he claimed to have called the attack "an act of terror" the day after it occurred. Romney was dead wrong, a victim of his campaign's--and the right-wing media's--tendency to turn molehills into anthills. After the debate, the infantile pedants at Fox News were debating whether an act of "terror" was the same as a "terrorist attack." This is the sort of right-wing casuistry that has marked not only the 2012 campaign but nearly every day that Obama has served in office.